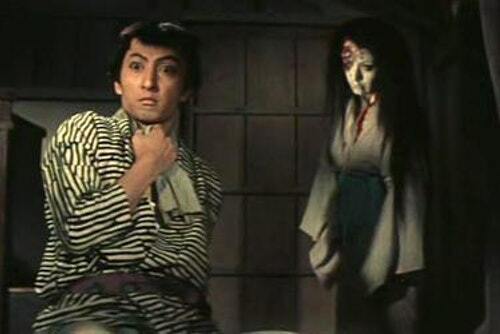 One of an apparently dozen or so adaptations of this particular legend, the history of the Yotsuya Kaidan story is an integral part of Japanese folklore since it was first printed in 1825 by Tsuruya Nanboku IV. The story has been adapted hundreds of times in Kabuki theaters as well as film versions dating back to the silent era, most of which are lost as of today, with over two dozens officially named adaptations and many more variations over the years, the influence and power of the story is still being felt in the Japanese film industry to this day. At the height of his career as the Father of Japanese horror, celebrated director Nobuo Nakagawa offered his own version of the celebrated story and stands as one of the finest efforts to date. 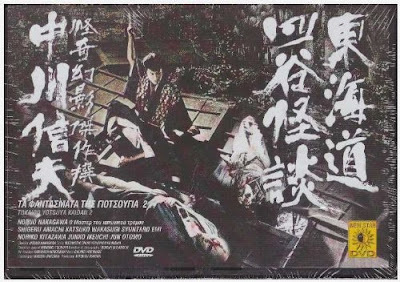 Tired of living in poverty with his wife, samurai Iemon Tamiya (Shigeru Amachi, from "Jigoku") hatches a scheme to kill Iwa (Katsugo Wakasugi, from "Ghost of Chibusa Enoki") with the help of his friend Naosuke, (Shuntarō Emi, from "Supai to Teisô") so he can marry Ume Itō (Junko Ikeuchi, from "Vampire Bride") a wealthier woman. As they live together and try to raise a family, he slowly grows more frustrated with their condition and wishes to hurry so that they can be together. When he carries out the event successfully, the two plan to live in a small village, but her ghost returns to torment him for the wrongful death and must find a way to stop it before he gets condemned for eternity. This is one of the most enjoyable and faithful variations of the story. Most of that is due to the film being a straight retelling of the story which comes off quite strong. With the first half retelling Iemon and Iwa's life in poverty together, these reinforcements of the societal gap between the two becomes heavily integrated with the original story. Since that is a major focus of the play, the scenes of Iemon slowly getting more confident and willing to dispose of Iwa becomes ingrained far more throughout here and tie the two together. Even more intriguing, since the exploits of those around him continually showcase their wealth against him, this becomes even more of a reason for him to act. While this isn't that action-packed during these early scenes, it wholly sets up the ghostly vengeance later on to be that much more fun. When the murder happens and the ghostly stuff starts to happen, it gets infinitely better through the use of actually having stuff happening. The initial scene where Iemon springs his trap in the hut that takes the most celebrated scene in the play to fruition with the deformed body of his wife begins sprouting boils on her face before the hair begins falling out in bunches around her. This gives her the kind of motivation for the necessary revenge angle used later on as these allow "Tôkaidô Yotsuya Kaidan" to surprisingly become far more watchable. With the last part of the film taken up by this use of classic Gothic horror tropes as the visions of the two ghosts appearing around the huts or appearing out of the swamp, moaning and madness all starts to come into play here in a series of long, extended scare scenes that take on a fine form of revenge against him. Seeing the deformed ghosts in spectacular make-up effects truly lets the revenge come into full force and throws the film into a high gear due to this fantastic payoff. The acting does manage to help out even more. Shigeru Amachi turns in a spectacular performance as Iemon. Greedy, hot-headed and violent, he's quite unlikable in the first half where he does nothing but plot the death of Iwa. His turn towards paranoia and complete terror in the second half sells the ghost coming back to haunt him effectively and the manic intensity he displays is truly impressive to watch. The sweet Katsugo Wakasugi plays Iwa as the type of typical Japanese wife during this feudal period. She doesn't do much but once she becomes the ghost she becomes far more enjoyable. She looks terrifying and sells the turn effectively. Shuntarō Emi as Iemon's friend Naosuke plays the loyal sidekick well, not being truly standout but the willingness to play along with his plans gives him a vile edge. Beyond that, nobody really is terrible or that impressive as they're just competent overall. There isn't much, but it does have a few flaws. The first half of this film has absolutely nothing of any real value as a horror film at all, looking absolutely like a lame drama about the social standing rather than anything to do with a ghost story, and it makes for some utterly boring and not at all interesting times. The endless talks of him trying to get a better life, the prodding from his friend who knows too much and the interactions with the wife all compounds together to make this a pretty bland part of the story. Although it's done to help hammer in Iemon's greed and Iwa's desire for revenge due to the story adaptation, this one really takes a while to get to that point. That pacing might not be as appealing to some as it could've been with a shorter setup. Overall, this is one of the finest Japanese classics of the time-period and remains one of the most enjoyable adaptations of the story done yet. The film is recommended to all fans of classic revenge-based Japanese horror or Asian horror cinema in general, while those not impressed with the pacing should heed caution.